It’s rare, but once in awhile a piece of gear transcends being just “a piece of gear” and earns “legend” status. In the group that I frequently run with, Pat’s helmet is one such piece. The Pat that I'm referring to is Pat Bourgeois, editor of OSM Magazine and the most prolific press release writer I know. In normal circumstances, Pat’s helmet would simply be a run-of-the-mill, black HJC full-face lid that’s no different from the thousands of others exactly like it. 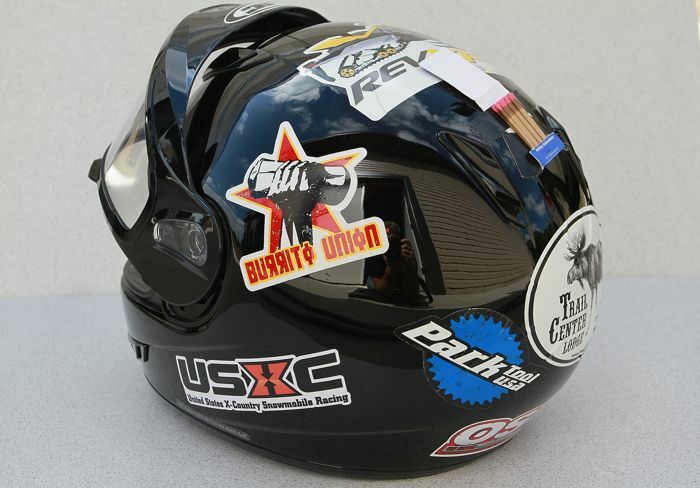 What makes Pat’s helmet legendary among our cadre of friends is WHY Pat came to own it, as well as the special love it’s received since he bought it that fateful day in January 2013. “F@#$!” exclaimed Pat, just moments after we’d pulled into the vehicle parking lot for the North Shore snowmobile trail outside of Finland, Minn.
A little harsh even for a chronic cusser like Pat, but understandable considering that he, Jason MacDonald and I had just driven three-plus hours to get to the trailhead; the temperature was a cool -15 F and getting colder; there was less than three hours of daylight remaining; and we were staring at a 120-mile ride to get to our lodge room at the end of the Gunflint Trail that night. Like the true friends that we are, Jason and I immediately skipped the sympathy stage and jumped straight into sarcastic ridicule. “It’s okay, Pat, I remembered my helmet so I’ll be fine,” replied Jason. Still stunned by the realization he was without a helmet, Pat had no reaction to Jason’s quip. “F@#$! Wild Bill,” he answered! He was serious. And he was motoring through the seven stages of grief, having zoomed through Disbelief and Denial before pausing at Bargaining. Jason and I had to tread lightly for a moment to get through Bargaining, Guilt, Anger and Depression to (hopefully) arrive at Acceptance/Hope in time to ride that evening. “I’m not going to use some piece of $#!T rental helmet,” replied Pat. Yep, still wallowing in the Bargaining stage by thinking he actually had other, better options. A quick search on the smartphone retrieved the phone number for Beaver Bay Sports, and a phone call brought great news: they were still open and had new helmets in stock for purchase. The 20 minute drive there was mostly spent laughing at Pat as he wallowed in self pity. He responded with grateful hand gestures. Actually, now that I think about it, Pat was in the Guilt stage. Jason and I pounced on Pat’s vulnerability by reminding him that he would be BUYING a helmet! 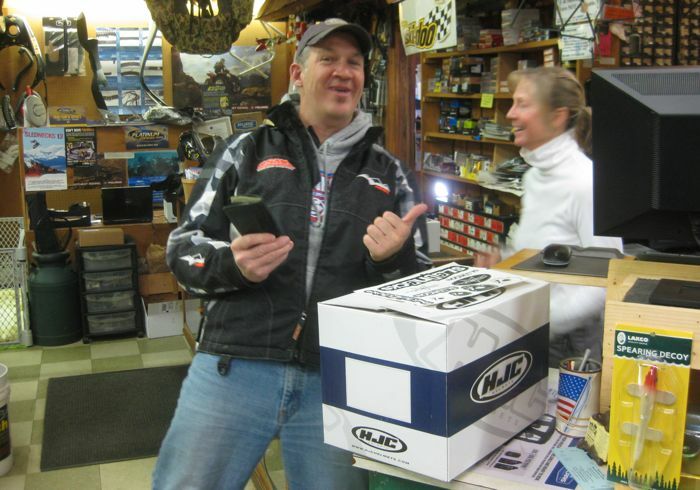 When we arrived at the modest showroom at Beaver Bay, it became abundantly clear that Pat would NOT be leaving with the latest multi-colored moto-style lid from Fly, MotorFist or any other currently hip company. He would be buying a full-face HJC in any color he wanted as long as it was black. Yep, out of the Guilt stage. A moment later, Pat let out another “F@#$!,” but a tone of hopeless resignation. Depression! Only one more stage to go and he’ll have made the necessary lap. 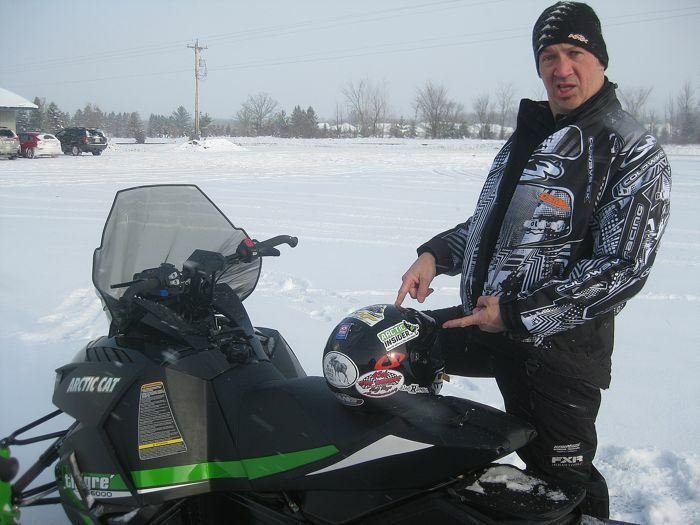 For a guy who looks as if he’s a walking billboard for all that’s new from the entire snowmobile aftermarket-clothing consortium, Pat must be commended for so quickly recalibrating his expectations. Jason and I helped by decorating the helmet as we drove back to the parking lot trailhead, using any and every decal we could find. 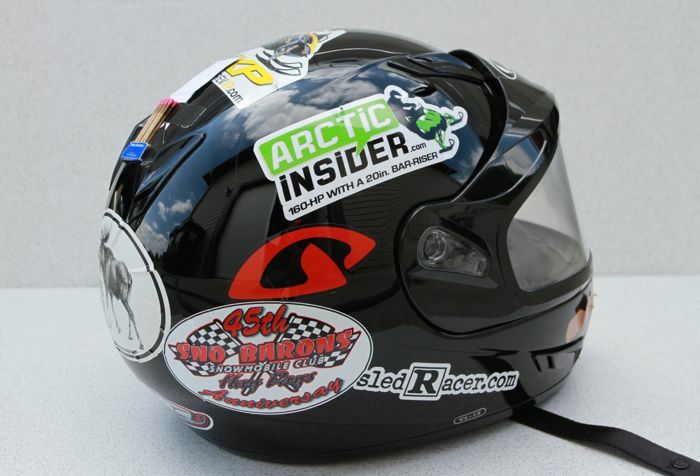 ArcticInsider and OSM Magazine decals... Hay Days decals... bicycle and restaurant decals... anything we could find. When we ran out of decals, we added a Band-Aid and used duct tape to secure book of matches. Pat was a good sport and simply allowed us to have our fun. I captured a shot of Pat and Jason just before we headed out for the Gunflint Trail, Jason pointing at the hastily decorated helmet as Pat shrugged his shoulders. As night fell and the temperature dropped to -25 F with 30 miles to go before reaching the lodge, Pat seemed pretty dang content to have the old-man touring helmet. 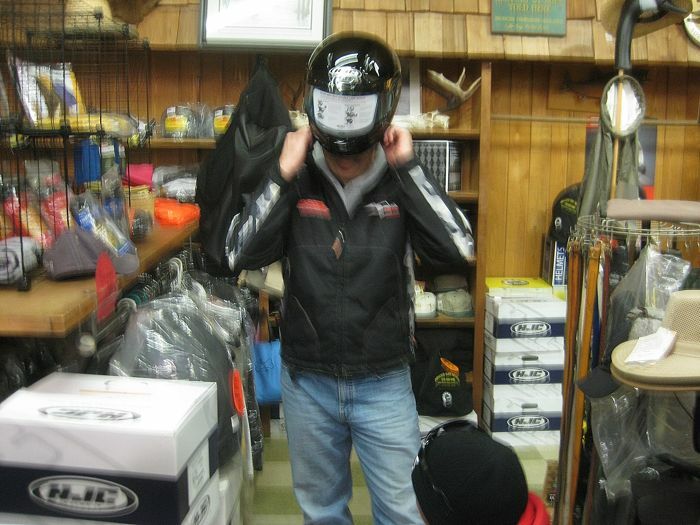 The rest of the trip was riddled with laughter about the helmet, of course. On the drive home Pat claimed that he would probably never wear his paid-for, custom lid ever again. He would retire it to his trophy case (aka the shelf in his garage) and promised himself to never forget a helmet on a trip again. A shipment of 20 or so new moto-style helmets waiting at his house upon his return probably helped with his resolve. That might have been the end of the story but, like any good tale involving salvation, this one also has a resurrection. Almost exactly one year after the original helmet ordeal, as our group donned gear for the St. 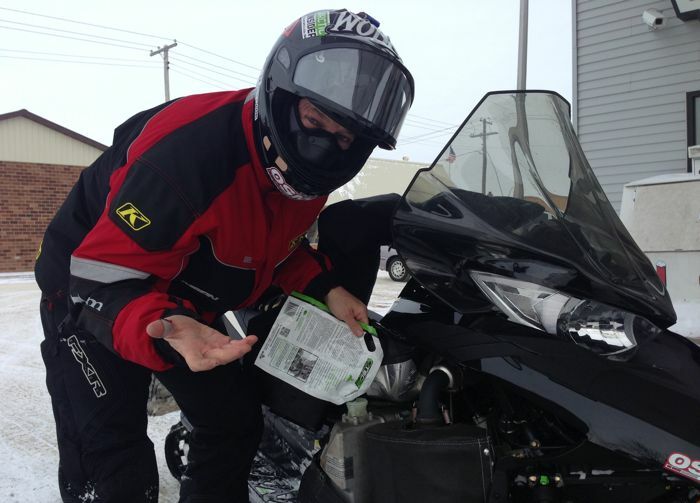 Cloud to Thief River Falls HERO ride with the thermometer showing -20 F, Pat pulled from his gear bag the decal-strewn HJC! Do you have a legendary or funny piece of gear that has a storied background? Share it in the comments section. Old touring helmet to match his old touring windshield! I love the burrito union ... no clutch what it is but it just seems awesome..
Back in the mid-1980's we had a couple brand-new vinyl tool bags laying around for a 1970 Puma. We grabbed one before a particular ride and filled it with tools, spark plugs, wire, tape, etc. Well, we never emptied it and are still using it today. 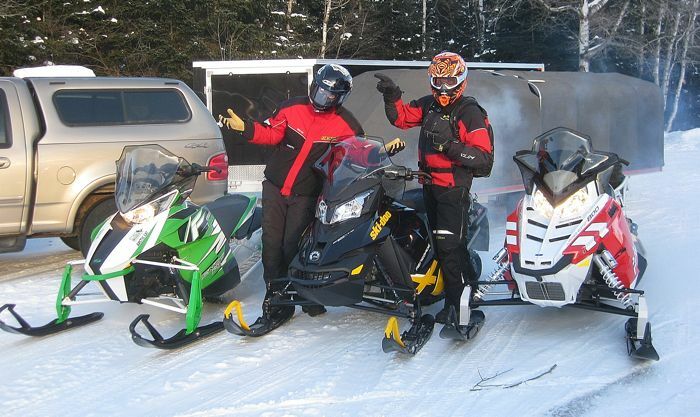 We've never actually mounted it to a sled as it was originally intended, just shove it in a toolbox or saddlebag. That thing has been in the back of so many sleds, been to so many different states/provinces and logged so many miles that it's funny. 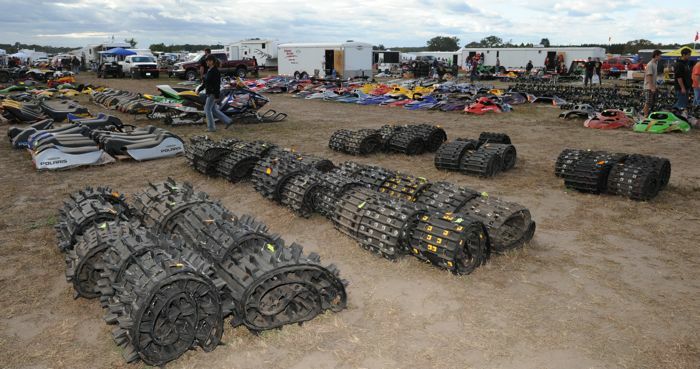 I put a little WD-40 on the metal zipper each December, shove it in a sled and go ride. I took the spark plugs out a few years ago, most everything else in there has stayed the same. Back in the mid 90's six of us were on 3 day saddle bag from St. Germain to Silver City to Copper Harbor and back to St. Germain. We pull into the motel in Silver City with no issues on the first day. Get up the next morning, eat breakfast. It had gotten down to -15* the previous evening and had warmed to -10* at this point. As were back in our rooms getting our gear on stuffing our saddle bags, John says "Where's my helmet?". A search of our room found nothing. Figuring one of the other guys had stashed it somewhere on him, John took off on a mission to locate his helmet while also planning some playback. I could hear accusations fly in the next two rooms, but John was helmet-less upon his return and his usual calm demeanor was in the same place as his helmet....lost. As we head to the parking lot to suit up, John is pleading with whoever in our group took his helmet to give it back. As we approach the sleds John screams "My Helmet!". There it was sitting on his seat...right where he left it when we unloaded the previous evening. Mindful of John's recent threats against all of us, we decided that there was no time to let his helmet thaw. The sky was blue and the trails were smooth...we needed to get riding right now. We stopped in Ontonagon for a break. While the rest of us were downing beverages and doughnuts, John was downing aspirin. He said he'd never had such a bad headache as the one he currently had.